I love this look from Pottery Barn. 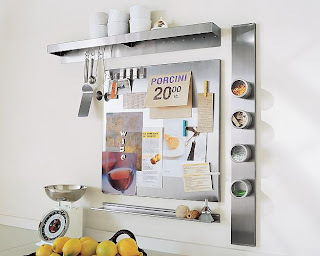 Talk an ideal kitchen wall--functional, attractive, stylish, complimentary to stainless appliances, everything. Love the look. Don't love the price. I did a lot of research and found almost the exact same board (20"x24" instead of 20"x20") at Cooking.com for half the price. I also found the magnetic containers pictured on the right hand side, at Cost Plus World Market for only $1.99...at Pottery Barn they run almost ten bucks a container. The stainless steel shelves are not to be had anywhere else unfortunately, but they do look fabulous and if you save on the other accessories, you don't feel so bad picking up the shelves full price. P.S. I've tried ALL the stainless steel cleaners out there and the best I've found is Weiman Stainless Steel Cleaner & Polish. i love that you found the look for less...can always count on you to discover a bargain! ever since our nordstrom rack trip i've had an urge to go to tjmaxx! miss you already!